Oluchi I has just claimed Paypal Custom Amount! 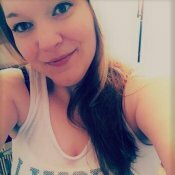 Krys M has just claimed $10 Amazon.com Gift Card! jorge P has just claimed $5 PayPal Money! Brittainy L has just claimed Paypal Custom Amount! For all the new members out there, we're sure that you're eager to get your wheels turning to start earning points on Prizerebel. 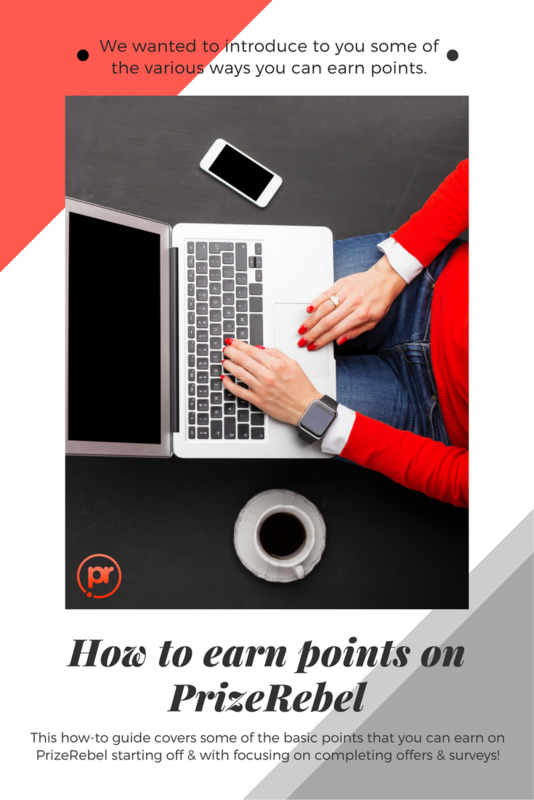 One of the biggest questions we get from new members revolve around how they can earn points or how they can get their free prizes. We wanted to introduce to you some of the various ways you can earn points. 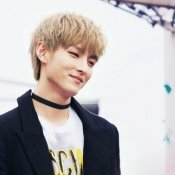 This how-to guide covers some of the basic points that you can earn on Prizerebel starting off and with focusing on completing offers and surveys! Get started with over hundreds of free rewards here, with activities that take less than 10 minutes of your time to complete! Right off the bat, you have lots of opportunities to earn easy points on Prizerebel! All of these opportunities are to help you get a head start to the prizes that you want to redeem for. Following us on Social Media: We're always showing love to our users back with exclusive contests and offers on social media. Make sure to follow us on Facebook/ Twitter/ Instagram/ Google+ for contests and promo codes! We're always handing out promo codes! These are usually limited time codes that can be entered on our site to earn additional free points. We recommend following all of our social media accounts as we're always releasing promo codes for free points on Prizerebel throughout the week! You can enter your promo code on the top right corner through the "ticket" Promo Codes:icon or on the bottom left half of the side under "Redeem Promo code". Offers are one of the favorite ways our members love to use to earn points. Offers usually involve completing a specific action on another site such as clicking on a banner on another site and signing up for the site. In order to receive credit for the offer, you must follow the instructions closely and complete the instructions closely. Other typical offer types include signing up and confirming your account by email or going through a few pages of suboffers and confirming your interest in any suboffers that you are interested until you get to the final page. On our home page, you can sort by offers specifically and sort either by dated added, recently credited, or highest points depending on how you want to tackle earning your points on Prizerebel. Some of our members like to create an alternative personal email to make sure that they do not miss any potential emails regarding an offer that they completed. Please keep in mind that this must be a real alternative email that you are using and that you must not be including any temporary email addresses. Make sure you are taking the time to read and submit any information required. Falsely submitted information or completing the offer too fast will result in non-crediting as advertisers are checking to make sure that you are taking the time to honestly submit information upon sign up. As you spend more time submitting quality information, you will earn more points to redeem for your free prizes quickly! We wanted to run through an example offer for you to demonstrate how short of a time it takes to complete the offer. On the homepage, we decided to select the ebates offer boxed in red. After clicking on the offer, you will be redirected to the actual site to sign up and confirm your email address. After signing up and clicking on the confirmation email that is sent to you, you're all done per instructions on the offer! 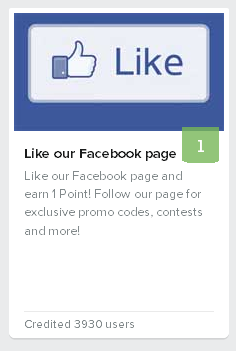 Points are automatically credited to your account when the advertiser credits us with the completion of the offer. Sometimes there may be a delay of 24-48 hours when the advertiser validates that the offer was completed correctly. We recommend that you do not use any adblocking software or firewalls that may prevent the site from registering cookies and cache as this may prevent you from being credited for the offer. 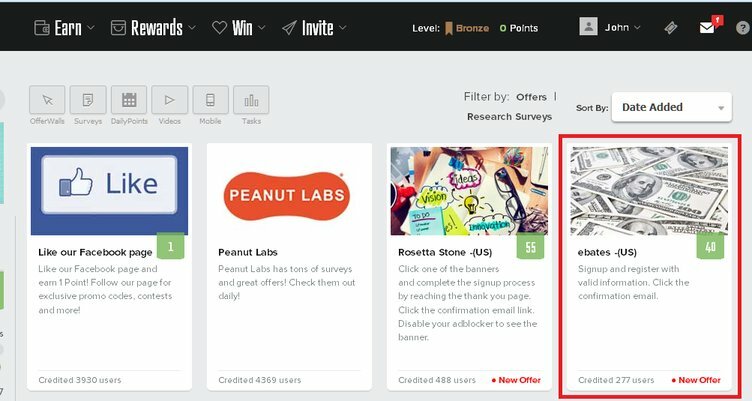 Surveys are another big component and tool that our members love to use to earn points on Prizerebel. Most surveys are conducted by market researchers who want your opinions on a subject they are testing. In order to get a better understanding of what group you belong to, you can fill out a profile that gives out general information such as your gender, house hold income, occupation, and members of household. The more information that you provide, the more specific the survey is catered to you or/and is more likely to fit. In order to help you qualify, we highly recommend you include as much demographic information about yourself as possible. This will be completed without giving out any personally identifiable information such as name or street address as these are never released for your privacy. Plus, you earn some additional free points just by submitting this information to start. 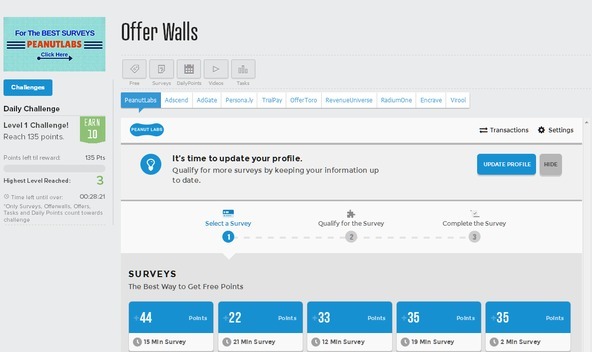 You may find that some of our external offer wall providers also offer an option to take surveys. Please make sure you fill out their profile section as well to qualify for more surveys that you can complete through the offerwall. 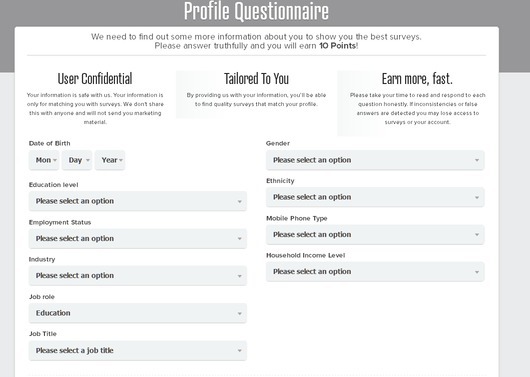 After completing the profile section, you're ready to complete some surveys to earn points on PrizeRebel! Each survey provider that we offer is a bit different but all of them will focus on asking you a few questions to verify and make sure that you are the right audience that they are looking for. 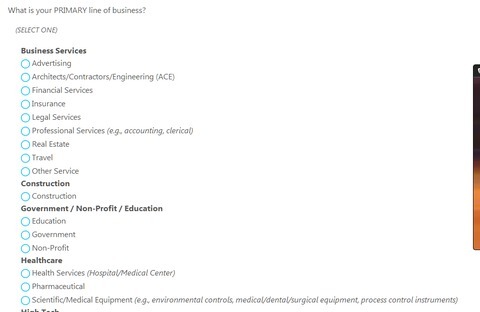 For example, in the below survey, the survey asks for the primary industry you are working in. Most of the first several questions you see are used to determine if you are the right fit for the survey so it is important that you answer them appropriately. 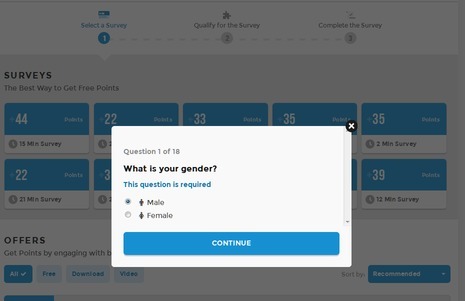 In order to receive credit for the survey, you must make sure that you finish the survey to the very end of the last page where you should get a page thanking you for completing the survey. If you do not reach the final page of the survey, you won't receive credit so make sure you see the thank you page before leaving. Make sure that you do not accidentally leave the survey before finishing as there is no guaranteed way that you will be directed back into the same survey. After completion, you should be receiving your points after the market researchers have checked and validated your answers. 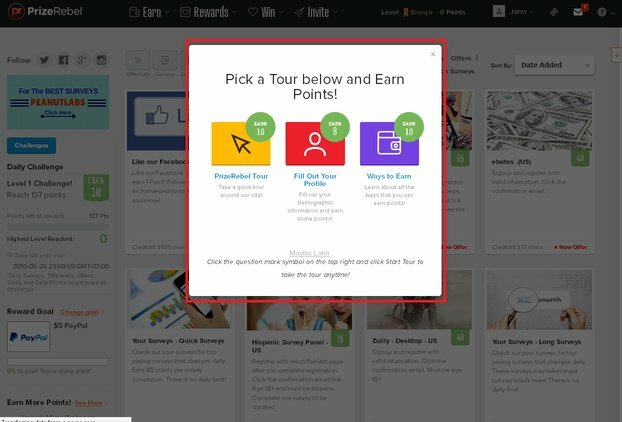 Videos are one of the best activities to earn points on from PrizeRebel! We offer several different video partners but the easiest one to get started with is EngageMe TV! To get started, click on the video provider and choose a video category that you are interested in watching. In order to make sure you get credited for your video activity, please make sure you are creating an account on EngageMe and linking it to your PrizeRebel account. Crediting occurs when you view the required amount of videos. Make sure that you are able to view the ads that are shown before and after the video! Adblocker extensions need to be deactivated when viewing videos; advertisers determine crediting for your account based on the ads that you watch. Once you are credited by the video provider, your PrizeRebel points balance will be automatically updated! 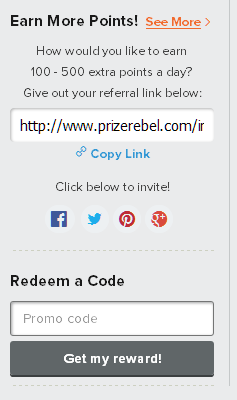 Now that you've gotten the breakdown on completing paid surveys and offers, you're ready to earn points on Prizerebel! Earn YOUR first free reward here, joining 7 million members earning rewards daily!